Madagascar is renowned for its unique biodiversity but also for the continuous degradation of its natural environment and its high poverty rate. In order to achieve sustainable development, environmental education has been assigned a key role. In the lake Alaotra region, Madagascar’s most important rice and inland fish production area, primary schools are the sole formal education for the majority of the population. In order to gain an overview on the education of ‘tomorrow’s’ resource users, this study assessed the general state of the school system and of environmental education in particular. The focus was on understanding local definitions of environmental education, its application and local perceptions of environmental problems. Over 50 in - depth interviews were conducted using the Funnel approach with teachers from 18 public primary schools. The interviews were supplemented with focus groups and a participatory problem analysis workshop. Teachers in the Alaotra region provided a different definition of environmental education than the United Nations. Their focus is on social aspects rather than the actual problems of the natural environment, which represents a different point of view than non - governmental organizations (NGOs) from abroad, who are the main promoters of environmental education in the area. This indicates that education for sustainable development might be more suitable in the region than the currently promoted environmental education. When developing educational programs, it is important to include the teachers in the development processes to ensure inclusion of local views and needs. This will increase the probability that such programs are locally meaningful and useful. Si Madagascar est réputée pour sa biodiversité unique, elle l’est aussi pour la dégradation de son environnement naturel et son taux de pauvreté élevé. L’éducation à l’environnement est un élément important dans l’accès au développement durable. Dans la région Alaotra qui est le principal producteur de riz et de poissons d’eau douce de Madagascar, l’éducation est dispensée presqu’exclusivement par les écoles primaires pour la majorité de la population limitrophe du lac Alaotra. Pour comprendre globalement l’éducation des futurs utilisateurs des ressources, l’étude a évalué la situation qui prévaut dans le système scolaire en général et celui de l’éducation environnementale en particulier. Les travaux se sont concentrés sur les définitions locales de l’éducation environnementale, sa mise en œuvre et les per­ceptions locales des problèmes environnementaux. Plus de 50 interviews détaillées ont été réalisées avec des enseignants de 18 écoles primaires sous méthode Funnel. Les interviews ont été complétées par des groupes de discussion et un atelier participatif portant sur l’analyse du problème. Les enseignants de la région de l’Alaotra ont énoncé une définition différente de l’éducation environnementale que celle proposée par les Nations Unies. Leur priorité porte davantage sur les aspects sociaux que sur les problèmes de l’environnement naturel lui-même, divergeant ainsi du point de vue des organisations non gouvernementales (ONG) étrangères, qui sont actuellement les principaux promoteurs de l’éducation environnementale dans la région. Il apparait ainsi que l’éducation portant sur le développement durable pourrait être plus appropriée que l’éducation environnementale. Lors de l’élaboration des programmes éducatifs, il est donc important d’inclure des enseignants pour veiller à ce que les visions et besoins locaux soient considérés, ce qui donnera plus de chances aux dits programmes de prendre du sens et de servir leur dessein. Antal, C. and Ndrianjafy R. K. 2013. Madagascar. From political divisionism to unified development. In: Education in Southern Africa. C. Harber (ed. ), pp 81–102. Bloomsbury Academic, London and New York. Arnold, C., Bartlett, K., Gowani, S. and Merali, R. 2007. Is Everybody Ready? Readiness, Transition and Continuity: Reflections and Moving Forward. Working Paper 41. Bernard van Leer Foundation, The Hague, The Netherlands. Brooks-Gunn, J. and Duncan, G. J. 1997. The effects of poverty on children. The Future of Children 7, 2: 55–71. Brock-Utne, B. 2000. Whose Education for All? The Recolonization of the African Mind. Falmer Press, New York and London. CISCO 2013. Statistique de l’Enseignement par ZAP, Circonscription scolaire Amparafaravola. Unpubl. report. Cotton, D. and Winter, J. 2010. It’s not just bits of paper and light bulbs. A review of sustainability pedagogies and their potential for use in higher education. In: Sustainability Education: Perspectives and Practive Across Higher Education. P. Jones, D. Selby and S. Sterling (eds. ), pp 39–54. Earthscan Ltd, London. Dewey, J. 2004. Democracy and Education: An introduction to the philosophy of education. Dover Publications, Inc. Mineola, N.Y.
Freire, P. 1970. Pedagogy of the Oppressed. The Continuum International Publishing Group Ltd, London. Hart, B. and Risely, T. R. 1995. Meaningful Differences in the Everyday Experiences of Young American Children. Paul H. Brookes, Baltimore, M.D. Heberlein, T. A. 2012. Navigating Environmental Attitudes. Oxford University Press, Oxford. Heugh, K., 2000. The Case Against Bilingual and Multilingual Education in South Africa. PRAESA, Cape Town. INSTAT (Institut National de la Statistique) 2012. accessed 18 January 2014. Jacobson, S. K., McDuff, M. D. and Monroe, M. C. 2006. Conservation Education and Outreach Techniques. Oxford University Press, Oxford. Lammers, P. L., Richter, T., Waeber, P. O. and Mantilla Contreras, J. In press. Lake Alaotra wetlands: ecological status quo in one of Madagascar’s most important rice and fish production region. Madagascar Conservation & Development. Liimatainen, A. 2013. United Nations Decade of Education for Sustainable Development. In: Encyclopedia of Corporate Social Responsibility. S. O. Idowu, N. Capaldi, L. Zu and A. D. Gupta (eds. ), pp 2606–2610. Springer Berlin, Heidelberg, Germany. McDuff, M. and Jacobson, S. 2000. Impacts and future directions of youth conservation organizations: Wildlife clubs in Africa. Wildlife Society Bulletin 28, 2: 414–425. Palmer, J. A. 2003. Environmental Education in the 21st century: Theory, Practice, Progress and Promise. Routledge London. Paulhus, D. L. 1991. Measurement and control of response biases. In: Measures of Personality and Social Psychological Attitudes. J. P. Robinson, P. R. Shaver and L. S. Wrightsman (eds. ), pp 17–59. Academic Press, San Diego. Pidgeon, M. 1996. An Ecological Survey of Lake Alaotra and Selected Wetlands of Central and Eastern Madagascar in Analyzing the Demise of Madagascar Pochard Aythya innotata. WWF/Missouri Botanical Garden, Antananarivo, Madagascar. Rafidimanana Rajosera, M. 2013. Integration de la Bande Dessinée Arovy fa harena en tant qu’Outil Pédagogique au Niveau des E.P.P d’Ambaton¬drazaka et d’Amparafaravola. Unpubl. Master thesis. École Normale Supérieur, Antananarivo, Madagascar. Raharijaona, R. L. J. & Randrianarison, J. 1999. Facteurs géologiques et cli¬matiques influençant l’érosion en lavaka et ensablement des rizières: le cas du massif d’Ambohitrandriampotsy du sud du Lac Alaotra. In: Actes du 4e Colloque International Organisé par l’Association pour les Montagnes Africaines (AMA). H. Hurni & J. Ramamonjisoa (eds. ), pp 159–172. Association pour les Montagnes Africaines, Antananarivo, Madagascar. Rakotoarisoa, T. F., Waeber, P. O., Richter, T. and Mantilla Contreras, J. In press. Water hyacinth (Eichhornia crassipes), opportunity or threat for the Alaotra wetlands and livelihoods. Madagascar Conservation & Development. Randrianja, S. and Ellis, S. 2009. Madagascar: a short history. C. Hurst and Chicago University Press, London and Chicago. Rendigs, A., Reibelt, L. M., Ralainasolo, F. B., Ratsimbazafy, J. H. and Waeber, P. O. In press. Ten years into the marshes – Hapalemur alaotrensis conservation, one step forward and two steps back? Madagascar Conservation & Development. Rivkin, M. S. 1995. The Great Outdoors: Restoring Children’s Right to Play Outside. National Association for the Education of Young Children, Washington, DC. Robson, L. and Rakotozafy, F. In press. 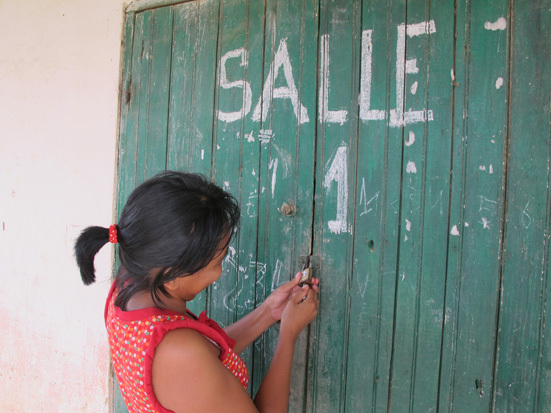 The freedom to choose: integrat¬ing community-based reproductive health services with locally-led marine conservation initiatives in southwest Madagascar. Madagascar Conservation & Development. Sharp, L. A. 2002. The Sacrificed Generation: Youth, History, and the Colonized Mind in Madagascar. University of California Press, Berkeley and Los Angeles. Shonkoff, J. P. and Phillips, D. A. (eds.) 2000. From Neurons to Neighbourhoods: The Science of Early Childhood Development. National Academy Press, Washington, D.C.
Sobel, D. 1997. Sense of place education for the elementary years. In: Coming Home: Developing a Sense of Place in Our Communities and Schools. M. K. Baldwin (ed. ), pp 32–39. Proceedings of the 1997 Forum, ERIC. Tilbury. D. 2007. Learning based change for sustainability: perspectives and pathways. In: Social Learning Towards a Sustainble World. A. E. J. Wals (ed. ), pp 117–132. Wageningen Academic Publishers, The Netherlands. UNCED. 1992. Agenda 21, Promoting education and public awareness and training, chapter 36. United Nations Conference on Environment and Development, Conches. UNESCO. 1976. The Belgrade Charter. Connect: UNESCO-UNEP Environmental Education Newsletter 1, 1: 1–2. UNESCO. 1978. The Tbilisi Conference. Connect: UNESCO-UNEP Environmental Education Newsletter 3, 1:1–8. UNESCO. 2013. Proposal for a Global Action Programme on Education for Sustainable Development as Follow-up to the United Nations Decade of Education for Sustainable Development (DESD) after 2014, Paris. WCED. 1987. Our Common Future. United Nations World Commission on Environment and Development. Oxford University Press, Oxford. Wittkowski, J. 1994. Das Interview in der Psychologie. Interviewtechnik und Codierung von Interviewmaterial. Springer Fachmedien Wiesbaden GmbH, Wiesbaden, Germany.